This holiday season, I wanted to try my hand at something a bit more "outside of the box" as far as desserts go, and started brainstorming something featuring the flavors of a cloved orange. Meghan suggested baby Bundts and I knew it would be a perfect fit. Add some delicious orange liqueur to the mix and your office party will be hopping in no time! -Coat the inside of a large Bundt pan or 1-2 baby Bundt forms with warm or melted coconut oil, then dust with flour. -Finely chop the pecans, then combine with the dry ingredients (minus the sugar) in a bowl and set aside. -In a stand mixer, combine coconut oil, butter and sugar for 3-4 min or until fluffy. Add flax gel ~3 T. (the size of a large egg) at a time, beating well after each. -Add the orange juice and combine. -Combine the nut milk and vinegar in a measuring cup. -Add 1/3 of the mixed dry ingredients to the mixer and combine, then add ½ of the buttermilk and combine. Repeat this step again, then end with the final third of the dry ingredients. Be careful not to overmix or the batter will have trouble rising. 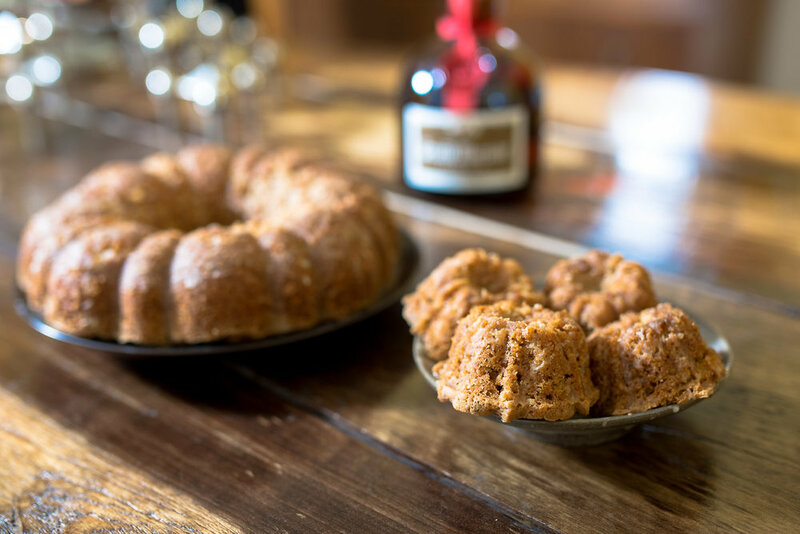 -Pour into the prepared Bundt pan or forms and bake 40-60min or until golden brown and a toothpick inserted near the center of the cake comes away clean; the smaller Bundt forms will take less time than a full Bundt pan, so plan your bake times accordingly. -Remove from the oven and let cool in the pan or forms for ~30 minutes, then invert onto a wire rack to finish cooling. -Combine the orange juice and liqueur in a bowl, then whisk in the powdered sugar in ¼ C. increments. Add up to an additional ¼ C. if the glaze is too thin. -Once the cake or cakes are almost fully cooled, transfer to a lipped plate and drizzle evenly with the glaze. More chopped pecans can be sprinkled over the glaze, or the cake/cakes can be topped with candied orange peel. For a more “adult” cake, place on a plate with a deeper lip and soak the base of the cake with an additional ¼-½ C. liqueur before glazing.